Walt Disney loved reading Winnie The Pooh stories to his daughter and he acquired the rights to the characters from A.A. Milne in the early 1960's. Steiff have now launched 2 new characters in their new Disney Winnie The Pooh Miniature Series, following on from Winnie, so here is MINIATURE TIGGER and look out for MINIATURE EEYORE, who is in stock now. 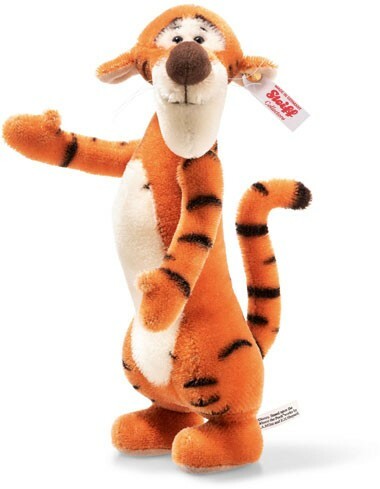 Tigger is Winnie The Pooh's great friend and he is a very excitable character and loves bouncing around. As he himself says "Bouncing is what Tiggers do best!" The Steiff Disney Miniature Tigger stands on two flat feet, ready to bounce and this shows off his springy tail. He is 3-way jointed at the head and arms and is crafted from the finest orange and white mohair. His stripes have been airbrushed by hand and so each one will be unique. He has a big chin, tickly whiskers and his big soppy grin will capture many hearts!! Tigger is loved by all and no Pooh, Steiff or Disney Collection is complete without it! He has the famous gold "Button in Ear" and a white label, showing that he is only limited to 2000 pieces worldwide, making it very collectable. Available to pre-order with no deposit. Click on 'Add to Cart', then click 'Pre-order' on the right. No payment required until the bear is in stock ready to dispatch.